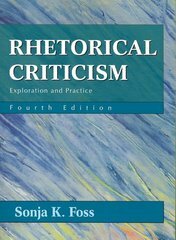 Rhetorical Criticism 4 Edition "Sonja Foss, who has an enviable talent for synthesizing complex rhetorical concepts and processes into clear explanations, presents nine methods of rhetorical criticism. She carefully explains and illustrates the theory behind each method with abundant examples of applications. Interesting and lively essays, some written by students, encourage readers to develop their critical skills. Useful bibliographies list additional samples for each type of criticism." "Rhetorical criticism is not a process confined to a few assignments in a rhetorical or media criticism course. It is an everyday activity we can use to understand our responses to symbols of all kinds and to create our own symbols to generate the responses we desire." --BOOK JACKET.